Please note: the Research & Visitors Centre is currently open by appointment only. From Cape Town: travel on the N2 and turn off at Caledon. Carry on straight to Bredasdorp (55km on the R316) , passing through Napier. Carry on through Bredasdorp with the main road and take the Swellendam Road (R319) to your left at the Engen Garage. 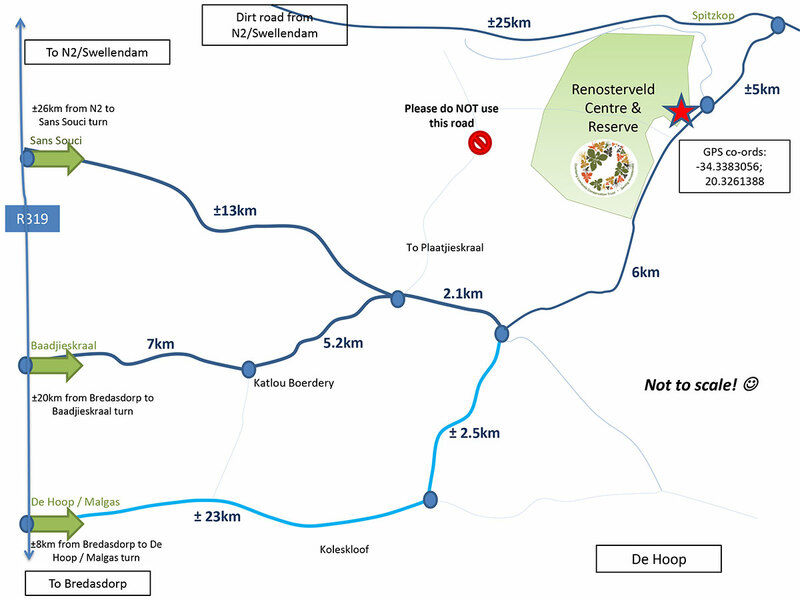 Then, either take the De Hoop Road to your right about 7km out of Bredasdorp and carry on along this road for approximately 23 km. Soon after passing Koleskloof farm on your right (where the Sout River goes under the road), take a turn to your left. Continue along this road and take the first farm road right (about 2.5 km along) and follow the road for almost 6 km where you will enter the reserve and then find the Centre / Guesthouse on your left hand side. OR: About 20 km out of Bredasdorp (on the tar road to Swellendam), take the right turn to Baadjieskraal. The rest of the way comprises dirt roads. About 7 km down this road, turn left at the T-Junction (the farm Katlou will be opposite you). After 5.2 km you will reach an intersection, keep going straight (i.e. stick right). About 2.1 km further along, turn sharp left (look out for this turn, it is easy to miss!) 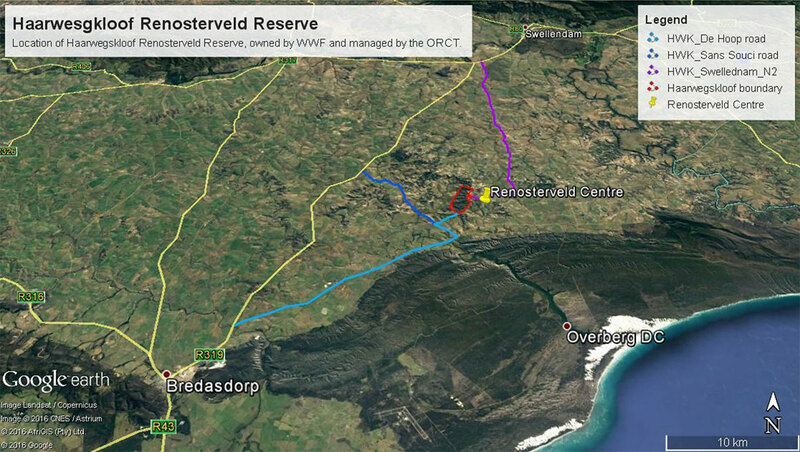 and follow the road for almost 6 km where you will enter the reserve and then find the Centre / Guesthouse on your left hand side. From Swellendam or the N2: take the Bredasdorp turn-off on the western side of Swellendam. Roughly 26km down this road, turn left at the Sans Souci turn-off. Follow the road past Sans Souci, past Lofdal until you reach a three-way intersection. Carry on STRAIGHT for another 2.1 km and turn left ((look out for this turn, it is easy to miss!). Follow the road for almost 6 km where you will see the Centre / Guesthouse on your left hand side. OR (more dirt road): Travelling towards Cape Town from Swellendam, take the Spitzkop turnoff to your left and follow this road for roughly 25 km until you see a farm called Spitzkop (Van Papendorp) on your left hand side. Shortly after this is a turn to the right (marked with a small sign with our logo) which will lead you straight to the Research Centre and guesthouse (about 5km down the road).